It went exactly as feared, or hoped, depending on which side of the fence you were on. If you came in expecting action then you were at the wrong fight. If you came looking for answers and a little bit of drama, then you probably came away satisfied, although perhaps a little bit disappointed. It wasn’t until I first saw them nose to nose at the kickoff press conference that I got a real sense of the size difference between these two men. The stats can tell you a lot, but seeing the two of them face to face, Manny looking up into Floyd’s eyes, really gave a sense of the uphill battle that Manny was facing. However, the fight was not about size, it was about styles, and the common wisdom was that Manny had the style to threaten Floyd. Manny was relaxed, loose, happy to be there and grateful to Floyd for finally making the fight. At the time it just seemed like Manny being Manny, but in hindsight I get the feeling that Manny just didn’t fully appreciate what he was up against. That had he really understood the situation he was about to face he would have been at least a little but angry. Anger would have served him well. But that is not who he is, at least, not anymore. Floyd was angry. Angry that anyone had dared question his dominance. Angry that for so many years, so many people were actually giving Manny a chance to beat him. Angry that he had to give away forty percent of the pot. Angry that he had to work with his former promoter, Bob Arum and his former network, HBO. He controlled his anger, much as he controlled every aspect of the fight. From the hastily run promotion to the action in the ring, Floyd was in control. That is all he ever wanted, well, that and the money. I am surprised at how little the outcome surprised me. I was pulling for Manny, but my rational side suspected just how the fight would play out, just like every other time the media built up a fighter as a challenge for Floyd. I wanted to see the underdog have his day and see the good guy win the fight. Not that I saw this fight as good vs evil per se, although I did find James Brown’s thinly veiled exoneration of Mayweather distasteful. Floyd is clearly not a good guy, and what he did was abhorrent, but it is unreasonable to expect all the people who beat up other people for a living to be good guys. I am not nearly as disappointed with the outcome as I thought I would be. 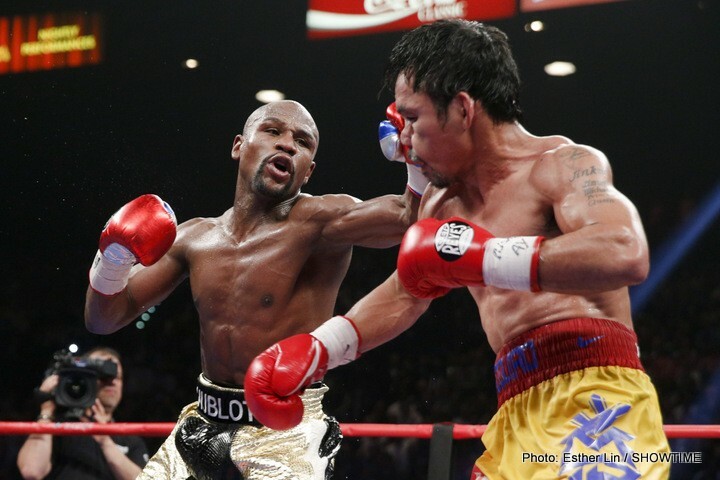 There were some competitive moments, rounds 4 and 6 especially where Manny connected with some good shots that had Floyd covering up on the ropes until the storm ran its course. Floyd was well prepared for Manny’s attack, he used his long jab to control the range, and his legs to stay out of harm’s way and avoid most of Manny’s lunges. Floyd was focused and business like, economical and efficient. Floyd was being himself. He wasn’t there to entertain and he made no real attempt to do so. He was there to win and collect the biggest payday in the history of sport, both of which he accomplished without question. So where do they go from here? For me the biggest disappointment with Manny’s performance was his own assessment of it in saying he thought he won the fight. I tend to agree with Lennox Lewis more so than Paulie Malignaggi, that this is more a case of being in the moment than sour grapes, and that when Manny sits down with Freddie Roach to review the fight cooler heads will prevail. Manny will fight again; top rank may give him a soft touch to build the brand up a bit before his next real challenge. Perhaps his PPV numbers won’t be what they were, but they haven’t been for a while. We might even get a showcase on regular HBO out of this, which would be nice. Manny still has good entertainment value, and despite the one sidedness of this fight, he still beats most welterweights. Floyd’s future, on the other hand, is a bit more problematic. He is like Julius Caesar, looking out over his empire and realizing that there are no worlds left to conquer. Floyd said he plans on fighting again in September for what he claims will be his final fight. In all likelihood his opponent will not be Keith Thurman, who despite being a fine fighter has not yet developed a main stream fan base. It will probably not be Amir Kahn either, unless Kahn is willing to put his wallet ahead of his Muslim faith and train during Ramadan. It will probably be someone of Mexican or at least very least Latino descent, as Floyd will once again seek to capitalize on the built in fanbase surrounding Mexican Independence Day. Or maybe it will simply be the next guy who beats Andre Berto. One thing is for sure, the next time Floyd is in against the “biggest challenge of his career” I won’t fall for it and shell out for the pay per view. And if you believe that, then I have a bridge in Brooklyn that I can sell you for a really good price.